The legacy of Moll Pitcher lives on! Our August 2nd “Medium’s Night at the Museum” was so successful, that Whispers From the Light is again collaborating with the Lynn Museum, here in Lynn, Massachusetts. Lynn is among the oldest cities in America, founded in 1629 on Boston’s North Shore, and has a very rich tradition of prophetic, psychic, and spirit communication–dating as far back as the 1600’s. The Lynn Museum celebrates our city’s rich history of Psychics, Fortune Tellers, and Spiritualist Mediums in this extraordinary event. 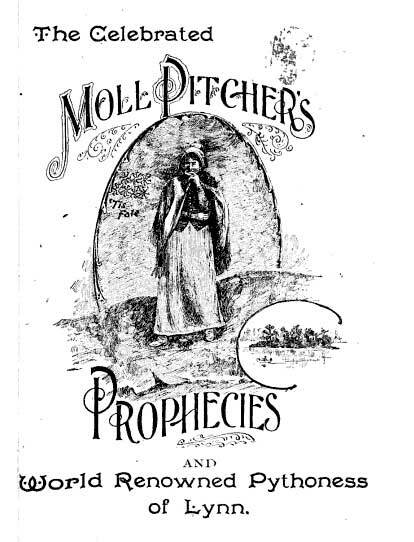 Named for Lynn’s Moll Pitcher, an internationally renowned 18th century clairvoyant and fortune-teller, Moll Pitcher Night provides a historical perspective on this 275-year old tradition of prophetic, psychic, and spiritual communications in Greater Lynn, followed by the “what” and “how” of the practice of modern-day mediumship. Participants will experience audience-style mediumship demonstrations in which short messages are delivered, while they wait for their 15 minute private reading—all provided by local mediums trained in the true Spiritualist tradition of evidential mediumship. Moderated by Lynn medium, Renee Buck, this is one event you’ll not want to miss! Ticket and Reservations: $30 per person. Ticket includes both audience style mediumship demonstration and 15-minute private reading with a medium. Space is limited, so reserve your place today through the Lynn Museum website. Bring with you: a notepad or journal to take notes of your reading and messages from Spirit. ← Moll Pitcher Night and Fall workshops! I just had to say hello…(I would have sent you a brief email, but I didn’t see an email link!) Anyhow, I just found your site…through a rather circuitous way…I was sitting up late knitting tonight, and for some reason decided to dig up my old John Edward book, then googled him, then Theresa Caputo, found the Forever Family Foundation website, then clicked on your name, because my maiden name was Mary Buck, which I thought was a pretty interesting coincidence! But then when I saw this site, and my eyes landed on the article about the Lynn Museum, I smiled, because my birth name was…Mary Lynn Buck. How crazy is that for a ‘coincidence’?! (And my married name for the past 22 yrs begins with an ‘M’, and the ‘B’ for Buck, has now become ‘my’ middle initial! 😉 Perhaps we’ll have an opportunity to connect someday? I’m still reading your site (or is this a blog?) I’m a 51 yr old mom of 4, photographer, artist, and teacher, in Pittsburgh PA. Nice to meet you!! I love when magick happens!